Alan N. Gordon, MD, is the new division director of gynecologic oncology in Emory University's Department of Gynecology and Obstetrics. 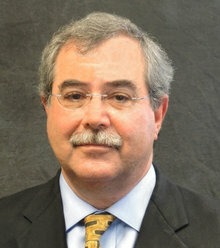 Alan N. Gordon, MD, an expert in the development and evaluation of new drug treatments for gynecologic cancers, has been named Director of the Division of Gynecologic Oncology in Emory's Department of Gynecology and Obstetrics, effective Nov. 1, 2013. Gordon’s clinical practice will be based at Emory University Hospital Midtown. He will also work in the gynecologic oncology division at Grady Memorial Hospital, and will have membership in and collaboration with Winship Cancer Institute of Emory University, Georgia’s only National Cancer Institute-designated cancer treatment center. "Throughout his career, Dr. Gordon has demonstrated a commitment to training future gynecologists and obstetricians and to fostering quality care for the gynecologic oncology patient, said Ira R. Horowitz, MD, chair of the Department of Gynecology and Obstetrics and John D. Thompson Professor of Gynecology and Obstetrics. "He is known by his peers for his humanism, surgical skills, outstanding investigative resolve and his strategically thoughtful administrative approach. Dr. Gordon’s innumerable contributions to clinical service, teaching and research are an asset to our department." Gordon is a board-certified gynecologic oncologist with 30 years of clinical and academic experience. He has served on the NCI Gynecologic Oncology Group Gynecology Committee, which works on the development of research protocols for gynecologic malignancies. He was also a member of the Society of Gynecologic Oncology Clinical Practice Committee, which worked to develop guidelines and practice statements for gynecologic malignancies that are followed by sub-specialists worldwide. Gordon comes to Emory from Mercer University School of Medicine, where he was the division director of gynecologic oncology, vice chair of the Department of Obstetrics and Gynecology, and director of the gynecologic robotic surgery program. He also had a clinical practice at Central Georgia Gynecologic Oncology. He has held previous academic and professional appointments at Baylor College of Medicine, Vanderbilt University School of Medicine, University of Texas Southwestern Medical Center, Texas Tech University Health Sciences Center, University of Arizona School of Medicine and University of Central Florida. Gordon received his medical education at Johns Hopkins School of Medicine and completed his residency at the Johns Hopkins Hospital. He completed a fellowship in Gynecologic Oncology at M.D. Anderson Cancer Center.